International award-winning cinematographer Ravi Varman's body of work, comprises films such as Jalamarmaram, Santham, Kilichundan Mambazham (Malayalam), Vettaiyadu Vilaiyadu, Dasavataram, Anniyan, Autograph (Tamil), Armaan, Phir Milenge, Ramji Londonwale (Hindi ) and Jai (Telugu) to name a few. He received the best cinematography award at the 23rd International Film Festival in France for Jayaraj's Malayalam film, Santham. He also donned the director's cap for Moscowin Kaveri last year starring Rahul Ravindran and Samantha Ruth Prabhu. Nine years after he worked with director Teja on Jai, Ravi Varman handles the camera for the high-budget Telugu film Badrinath produced by Allu Aravind and directed by V V Vinayak. He shares his experience of shooting the film against a Himalayan backdrop, and working with Allu Arjun and Tamannaah. Why did you choose to work on Badrinath? I've not done any Telugu film for about nine years. I try to do one film in each language, and it was the right time to do a Telugu film. The producer, Allu Aravind, is one of the finest producers in Telugu. The director, V.V. Vinayak, is a good human being who is best known for his commercial films. I heard the story and that the backdrop was the Himalayas, a visually appealing backdrop for any cameraman. Any kind of light is good there and there is no pollution so one can get sharp images. I told the producer I have to shoot in Panavision and I need a foreign colourist. Panavision lenses are among the best. A foreign colourist has a different perspective and their vision is also different. The producer agreed to both the requests. Has the film got anything to do with the Badrinath temple? It's an action-oriented love story and the Badrinath temple is a backdrop. Where was the film actually shot? The film was shot on a set in Kulaba on the way to the Rohtang pass. We also shot in the Badrinath temple, on sets in Hyderabad and in Spain, Italy, Germany and Austria. The film has some good sets including one of the temple put up by Anand Sai. Yes, it is very nice. Anand Sai is a fantastic art director. After Thota Tharani, he is one art director who draws himself. You said you used a Panavision lens. What other techniques and methods did you use for this film? Panavision lens is close-focus, anti-glare. There is boldness in framing. The film Gladiator and Mel Gibson's films are shot with this lens. What the naked eye sees can be brought onto the screen. Each film is different and I try for different looks. I want to present myself as a new cameraman with every film. I tried something different in Badrinath, though the opportunity to do this is less in a commercial film. I thank all the lighting and camera crew who worked hard. In the mountains, there is less oxygen and many people had breathing problems. Some were down with viral fever. Despite all the odds, they all worked and we never compromised on anything. What were the challenges you faced while shooting? The biggest was to maintain the lighting consistency. Suddenly there would be shadow and rain and I would have to match that. I tried to match that for 65 days. 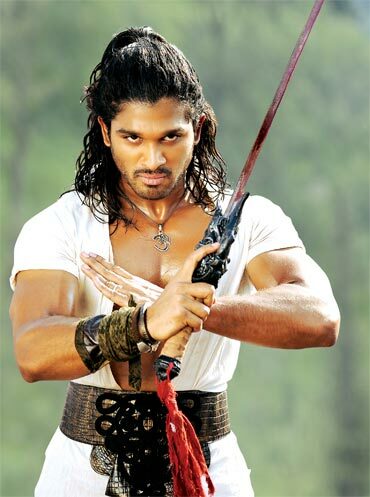 The film has a lot of action considering it's an Allu Arjun film. How did you shoot those portions? The action is interestingly choreographed by Peter Haynes. Each fight has a different look. What was it like working with Arjun and Tamannaah? Arjun is good. I have known Tamannaah for the last eight years. I did her first commercial. She is very professional. Even now she has the same attitude. When we shot in Austria, she acted for eight hours in the snow wearing costumes that were not warm. What was it like working with director V.V. Vinayak? He is a good human being a very adjusting person. He took care of me well. We got along well. There was no misunderstanding. We worked happily despite the difference in language. Could you say something about the producer? You can see that there has been a lot of expense on this film. I brought in a colourist and that is very expensive; the producer gave me all the facilities. Both the producer and director were good to work with. It was a good experience as I spent one year on the film. Whatever equipment I asked for was new to the industry and given to me after I convinced the producer it was necessary. I will be working on a Mani Rathnam production which is directed by his assistant Sivakumar, in Hindi. I am doing Adutha Thalaimurai to be directed by Cheran. In between I will be shooting several commercials. When do we see you directing your next film? I will direct a film soon. Pictorial warnings on tobacco stuff are useless!